Exploring Toronto's Sugar Beach in Cougar's Spring/Summer line. A few weeks ago I shared this photo on Instagram of these cute shoes I was sent. 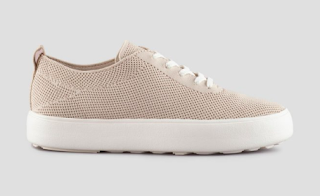 Cougar shoes sent me this (free) pair of knit sneakers that launched with their Spring/Summer line and I am loving them! They are the perfect casual shoe that can be paired with so many different outfits. These are ideal for travelling and exploring for the day because you can wear them with pants or a dress. I know these will be perfect to take to Paris with all of the exploring we have planned! If you need a pair of cute shoes for travelling or general adventuring, these are a great pick!